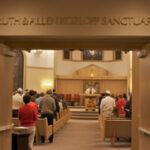 Reform Congregation Oheb Sholom welcomes visitors, and we invite you to participate with us in our religious services. We hope this introduction will provide you with the information you need to understand, feel comfortable, and get the most from your visit. As Jews, we pray directly to God, without an intermediary such as a minister or priest. The rabbi, meaning “teacher,” leads the services, announces which prayers are being said, provides explanations, and tells the congregants which prayers should be said while standing. If the rabbi is unavailable, a lay member of the congregation will lead the services. The prayer books are written in Hebrew and English, and have English translations for each Hebrew prayer. Some books also have transliteration, i.e., Hebrew written in Roman letters. Since Hebrew reads from right to left, the books will appear to open from the wrong direction, but the pages are numbered so you will be able to follow the services. You are welcome to attend any Shabbat service held at Oheb Sholom. While all services contain the same principle elements, there are some differences in the form and specific prayers. The Jewish Sabbath begins at sunset each Friday and concludes at sunset each Saturday. Therefore, Shabbat services are scheduled on Friday evening and occasionally on Saturday mornings. Visitors are encouraged to participate in the services, including the refreshments and/or meals following them. Please see our Calendar for upcoming service times. Friday evening services last 60 to 90 minutes, and are followed by an “Oneg Shabbat,” a reception starting with blessings over wine and bread, and continuing with refreshments. Saturday morning services last about 2 hours. The service is followed by the blessings over wine and bread, and occasionally refreshments or a buffet lunch in the social hall. When attending services, participants may choose to cover their heads as a sign of respect in the sanctuary by wearing kippot (also known as yarmulkes or skullcaps). You’ll notice that some Jewish men and women wear a Tallit (prayer shawl) during services where the Torah is being read, but since that serves a religious purpose, non-Jews do not do so. During religious services, please do not use cell phones or other electronic devices, use a camera or take pictures, or smoke (actually, the entire synagogue is tobacco-free at all times). For additional information, you may want to read “Everything You Need to Know About Shabbat Services” or other articles at the website reformjudaism.org.